On April 13, after almost a year of negotiations, Verizon workers from Virginia to Massachusetts represented by the CWA and IBEW, officially went on strike. From the start of these tense negotiations, Verizon has demanded excessive concessions from rank-and-file workers. The telecoms giant wants to force workers to spend months separated from their families in the name of additional corporate profit. Verizon also wants to close down more locations in the United States to ship those jobs overseas and pay poverty wages. For a company that in 2015 raked in close to $1.5 billion A MONTH in profits, adding to a total of $39 billion in profits over the last three years, this is despicable. Verizon is trying to change workers schedules and cut their pay not out of financial hardship, but blatant corporate greed. Verizon workers in the Northeast are putting it all on the line for workers’ rights and respect. On April 21st students, workers and union members in Central Florida took a stand in solidarity. 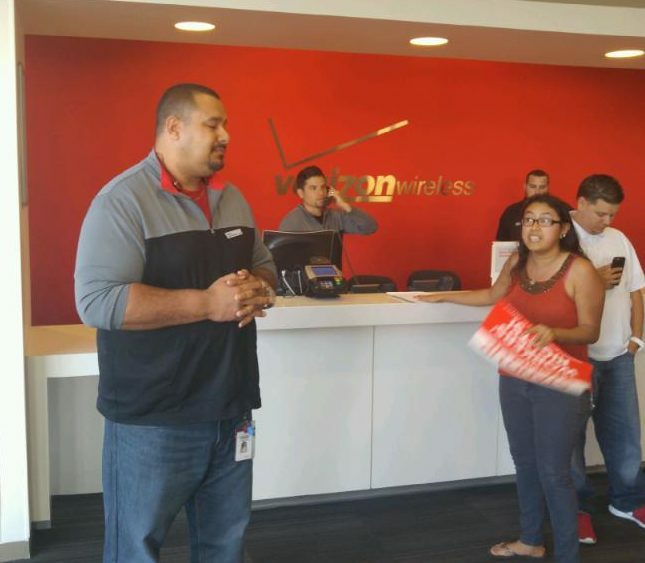 Joined by CWA Local 3108, Central Florida AFL-CIO, Central Florida Jobs with Justice, and the Student Labor Action Project at UCF, over 30 people held a rally in support of the Verizon strikers at a local Verizon Wireless store. The delegation crafted a community letter of support, demanding Verizon CEO Lowell McAdam come to the table and respect the workers. Due to strike rules, our non-CWA and IBEW affiliate attendees and community members entered the store to have a conversation with the manager and deliver the community letter of support. Management was immediately intimidated by the community support and called for a police response. Despite the manager’s insistence we didn’t back down, and left the letter with them. This was the first solidarity action outside of the strike zone, but not the last for us. As our brothers and sisters in the Northeast continue the fight so will we. 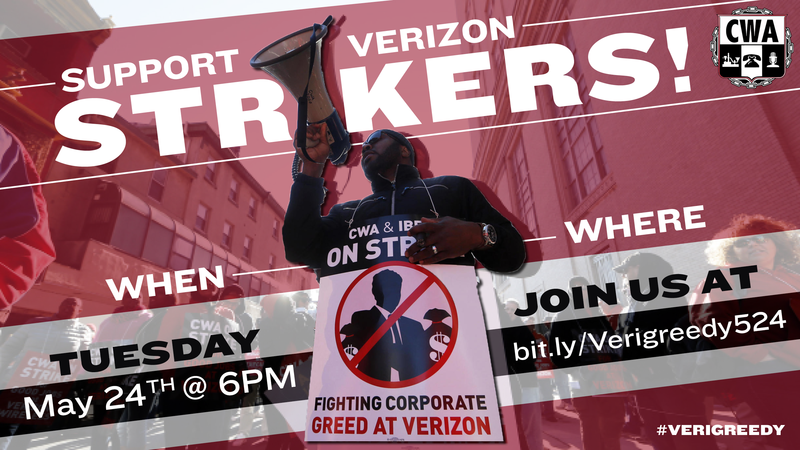 Please join us as we once again take action in support of the Verizon strikers on Tuesday, May 24. Every delegation matters, as we pressure Verizon to value people over profits.